A team of clinicians from Plymouth and Sydney have launched ACEmobile - a free-to-use app to support the assessment of dementia, worldwide. 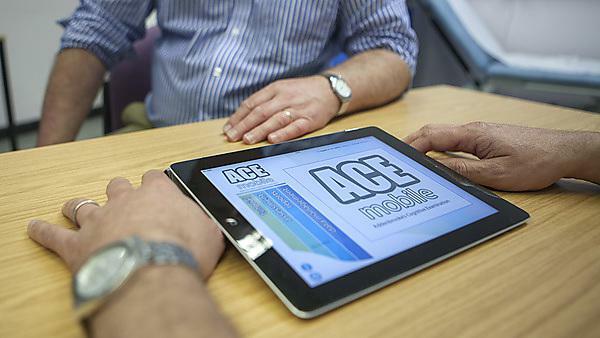 ACEmobile is currently an iPad-based tool that guides the user through the Addenbrooke’s Cognitive Examination (ACE-III). The ACE-III is one of the most popular and commonly-used paper and pencil screening tools for dementia. The app removes the need for clinicians to learn the ACE-III manual and it also automatically calculates patients’ scores and creates a report to go into their medical records. ACEmobile represents a potential significant step forward in the world of dementia research since it is being provided to the NHS and research bodies for free and the developers have no intention of generating commercial profit. A test sample of clinicians has had advance use of ACEmobile and the feedback has been unanimously positive. The development of ACEmobile has been a collaboration between Professor John Hodges (Neuroscience Research Australia), Dr Rupert Noad (Plymouth Hospitals NHS Trust), Dr Craig Newman and Professor John Zajicek (Plymouth University Peninsula Schools of Medicine and Dentistry) and has been supported by funding from an NIHR Programme Grant for the Study of Clinical Trials in Neurodegenerative Diseases, Plymouth Hospitals NHS Trust and the NIHR Collaboration for Leadership in Applied Health Research and Care South West Peninsula (PenCLAHRC).